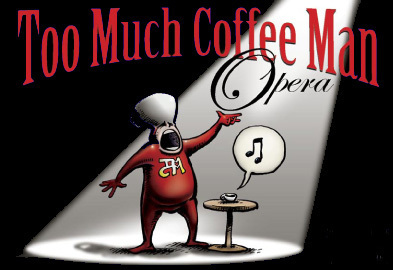 Too Much Coffee Man Opera – a zany, hilarious, romantic, one-hour, one-act Gonzo Opera that pays tribute to the fantastic wonders of coffee – makes a triumphant return to the Freight! What is Gonzo Opera? It’s real opera – not parody or pastiche – that allows performers to do all the wonderful things they do in classical opera, like act and wear costumes and sing arias, but using wild and crazy plots and situations beyond the realm of traditional opera. That’s where Too Much Coffee Man Opera comes in, based as it is on the comic strip character Too Much Coffee Man, the anxious, over-caffeinated superhero created by award-winning cartoonist Shannon Wheeler, who, incidentally, started his career at the Daily Cal with his strips “Calaboose” and “Tooth and Justice” and has published his work in the Onion and the New Yorker, as well as in several books and comic books. Shannon wrote the libretto for the opera, and Emmy-winner Daniel Steven Crafts composed the score. The opera debuted in Portland, Oregon and has since played in Albuquerque and at ComiCon in San Diego, always to sellout crowds. “Hilarious, utterly original, and you’ve got to see it,” says the Albuquerque Journal. “A grand synthesis of the arts,” says the Oregonian. This show may not be traditional yet, but it has a chance of becoming traditional. Why not load up on a double Americano and bop over to the Freight to check it out?